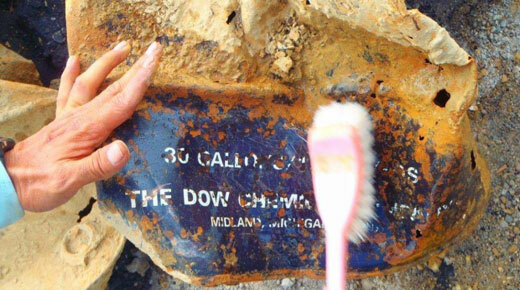 Eighty-three barrels labeled for toxic chemicals – some clearly marked “Dow Chemical” – have recently been discovered buried in land that was formerly part of the U.S. Air Force Kadena Air Base in Okinawa, Japan. The site is now the Okinawa City soccer field and also borders playing fields of two schools for children of U.S. military personnel on the base: Bob Hope Primary School and Amelia Earhart Intermediate School. Tests have revealed dioxin, herbicide and arsenic in the surrounding soil. U.S. service members and their families as well as Okinawans have been shaken by the news. Dow Chemical Co., based in Midland, Mich., was the manufacturer of the deadly defoliant Agent Orange massively used by the U.S. in Vietnam in the 1960s and ’70s during the Vietnam War. Dioxin is a key ingredient of Agent Orange. It is linked to high rates of cancers and other diseases among U.S. veterans and Vietnamese survivors of the war, and birth defects among their children. Dioxin dissipates in sunlight but can remain toxic for decades when buried in the ground. Retired U.S. Air Force Major Ronald Thomas told The Japan Times in January that in the late 1960s when he lived on the Kadena base he regularly transported empty barrels to land near where the schools now stand. At that time the land was used as an unofficial dump site. “They were 55-gallon and, on occasion, 30-gallon drums. You could smell the chemicals and a few were stenciled with ‘Defoliant’ in white with ‘Property KAB Special Services,’ ” Thomas said. Some of the drums were buried, and others were burned or sold to local Okinawan residents, Thomas said. Thomas said he was not sure if the barrels contained Agent Orange. Other U.S. veterans insist that Agent Orange was sprayed, stored and buried on Okinawa during the Vietnam War. The Pentagon has continually denied this, and the Veterans Administration has denied a number of compensation claims from veterans who linked their illnesses to exposure to Agent Orange on Okinawa. However in October last year the VA awarded compensation to a retired Marine truck driver suffering from prostate cancer who said his illness was triggered by his transport and handling of Agent Orange on Okinawa between 1967 and 1968. His claim was initially rejected like others, but he appealed. The judge who ruled on his appeal found his claims “highly credible.” A few other similar claims have also won compensation. Thomas said he contacted both Kadena base officials and the U.S. military newspaper Stars and Stripes with his story and urged them to take action. Neither followed up, he said. “They don’t want to open that Pandora’s box up. It’s better for the (base authorities) and the Japanese government to say there is no problem,” Thomas said. He may have been referring to concerns by U.S. officials and Japan’s right-wing government that the issue could add to the already widespread Japanese opposition to the heavy U.S. military presence in Okinawa. The U.S. has 32 bases on Okinawa Island, occupying approximately 20 percent of the island’s area. There has been a long history of complaints and mass demonstrations over endangerment of the local population by U.S. military aircraft, base operations including environmental damage, and abuses including rapes by U.S. troops. A heated struggle is going on over U.S. plans to relocate its Futenma Air Base from one part of Okinawa to another, with residents fiercely opposing the move and calling for getting the base off Okinawa. The Air Force is telling U.S. military personnel and their families at Kadena that there is no threat to their safety. But these assurances are being met with skepticism. A service member formerly stationed at Kadena noted that the site where barrels were unearthed is about 100 yards from base housing, and is an area where military people often walked their dogs. “In our small organization of otherwise healthy young people, an unbelievable rate of cancers exists. Multiple breast cancers, brain cancer, brain tumors,” said the service member, who did not want his name used. “Many children living on the air base have developed childhood cancers, tumors, and other diseases,” he said. On Jan. 28, the Kadena commander held a meeting with military parents to assure them that their children’s schools at the base were safe from dioxin contamination. The meeting came as a growing number of parents affiliated with the base expressed anger that they had not been notified of the problem promptly, and said their children’s serious illnesses may have been caused by dioxin exposure, or voiced fears about the likelihood of future illnesses. A Facebook group called “Bob Hope/AEIS – Protect Our Kids” currently has more than 830 members. Simmons said her family’s doctors could not explain her children’s illnesses. Her son attended Bob Hope Primary School and often played on its fields. But Kadena Commander Brig. Gen. James Hecker assured his audience of about 100 U.S. service members and their families that there were no indications the base was polluted. According to the Citizens Network for Biodiversity in Okinawa, an Okinawan nongovernmental organization, an initial investigation by the city of Okinawa found that the residues in the barrels and the surrounding soil and groundwater included dioxin compounds and the toxic chemicals 2,4,5-T and PCB, with small amounts of arsenic in the soil. The city report recommended further investigations to determine the range/area, depth and degree of contamination. On Feb. 24, the Air Force released results from Feb. 1 tests of “on-base” soil at the two schools at Kadena. According to the Air Force these tests “confirmed” that the soil at the school fields “is fully compliant” with Japanese government environmental standards “and does not pose a health risk to staff and students.” The report also concluded that personnel on the base were “unlikely” to be affected by toxic chemicals from the barrels unearthed in the “off-base” soccer field. “No further surveillance is required,” the report said. However Dr. Masami Kawamura, director of environment policy and justice at the Citizens Network for Biodiversity in Okinawa, disagrees with the Air Force’s conclusions. “it is impossible at the moment for anyone to declare the safety, because the investigation has not been finished and the range and depth of contamination has not yet been decided,” she said via email this week. Japanese authorities have not completed their own testing. Some of their results are expected in April. In 2012 the U.S. agreed to reduce its military footprint on Okinawa, turning some base land over to Japan. The Japan-U.S. Status of Forces Agreement exempts the U.S. from any responsibility to restore returned land to its former state or to pay money for doing so. Japan must pay for pollution removal and other such costs. In addition, the U.S. is not required to allow Japanese officials access to its installations to conduct environmental tests. Perhaps it is not coincidental that in December 2013, as the furor over the dioxin-laced barrels grew, the Pentagon announced the start of U.S.-Japanese talks on adding environmental provisions to the SOFA with the aim of “further strengthening bilateral cooperation in this field by recognizing the importance of the environmentally friendly operations of U.S. Forces in Japan.” The announcement noted the “importance of environmental protection and its contribution to managing risk to human health and safety.” Some commentators view this with skepticism, believing it an attempt to deflect the anti-base movement in Japan. Okinawan activists have been pressing their local government for years to investigate reports of the presence of Agent Orange. They say local and national government officials simply passed along U.S. denials that the toxic chemicals were ever stored on Okinawa. But the revelations of the 83 barrels at the soccer field adjoining Kadena have changed the picture. The news shocked Okinawans who have regularly seen children playing in the contaminated field, Dr. Kawamura noted. It has raised Okinawans’ awareness of their right to be informed of the real facts, she said, and increased pressure on Japanese officials to “get the truth,” she said. Environmental pollution from U.S. bases in Japan, including toxic contamination, is not a new or isolated issue. Next month, Okinawa Prefecture will open a new division dedicated to investigating environmental pollution on former U.S. base land scheduled for return to civilian usage. That would include six U.S. military facilities and areas south of Kadena Air Base that are slated to be returned to Japan. Photo: A Japanese worker brushes away dirt from one of the barrels unearthed at the Okinawa City soccer field last summer. Okinawa City photo. Susan Webb is a retired co-editor of People's World. 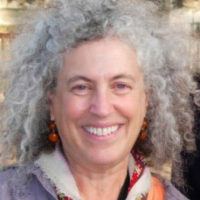 She has written on a range of topics both international - the Iraq war, World Social Forums in Brazil and India, the Israel-Palestinian conflict and controversy over the U.S. role in Okinawa - and domestic - including the meaning of socialism for Americans, attacks on Planned Parenthood, the U.S. as top weapons merchant, and more. Previously she taught English as a second language and did a variety of other jobs to pay the bills. She has lived in six states, and is all about motherhood, art, nature and apple pie.